When it comes to protein supplements, whey protein makes a good choice that's easily absorbed and rich in all the essential amino acids. They may make a healthy addition to a weight-loss plan, but whey protein shakes alone won't magically melt away those unwanted pounds. To benefit from a diet that includes protein shakes, control your overall calorie intake and add resistance training to your plan. Before you start downing whey protein shakes, consult your doctor or a dietitian for weight-loss tips and shake suggestions. Whey protein supplements may not be your favorite weight-loss aid, but they can help you lose fat instead of muscle, according to a 2008 study published in Nutrition Journal. This study found that a whey protein meal-replacement shake helped a group of overweight and obese individuals following a reduced-calorie diet lose more body fat than muscle. Why is it important to retain muscle tissue? Because muscle burns more calories than fat tissue -- 6 calories per pound versus 2 calories per pound, respectively, according to research published in the American Journal of Human Biology in 2011. When you lose weight, you typically lose both muscle and fat, which causes your metabolism to slow and may make it harder for you to slim down. Drinking a whey protein shake may help prevent some muscle loss, which may make it a little easier for you to continue to lose fat. Whey protein may also help you control hunger, according to a 2014 study published in the European Journal of Clinical Nutrition, which may make it easier for you to stick with your diet. This 12-week-long study compared the effects of whey protein versus casein, also a milk protein, and a carbohydrate supplement on hunger levels in a group of overweight and obese participants, and found that the whey protein worked better at keeping away the desire to eat than the other two supplements. While whey protein shakes may help you reach your dieting goal, this won't work if the shakes contribute excess calories. Weight loss requires a negative calorie balance, which means eating fewer calories than your body needs. If 1 pound of fat contains 3,500 calories, you can lose 1 pound a week by subtracting 500 calories a day from what you need to maintain your current weight. For example, using an online calorie calculator, a 40-year-old 5-foot, 8-inch woman weighing 175 pounds who rarely exercises needs 2,100 calories per day to maintain her weight, but can start to lose by reducing her daily intake to 1,600 calories. There are several types of whey protein shakes, so pay attention to total calories per serving. Calories from any source count, especially when you're trying to shed pounds, so count them in your daily total. 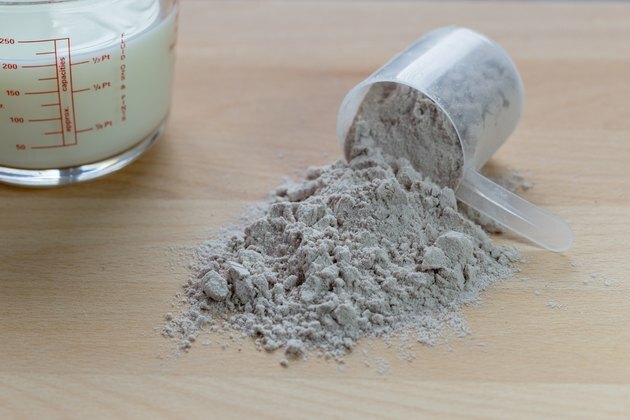 Calories and protein in whey protein supplements, primarily available in powder form, vary among brands -- some popular whey shake products range from 110 to 170 calories and 24 to 28 grams of protein per scoop. In addition to helping preserve muscle while you're losing weight, combining a whey protein shake with resistance training may help you build more muscle. Whey protein contains the right balance of amino acids needed to support muscle growth, and is a good source of leucine, which is critical for muscle building. When you add muscle to your frame through resistance training, it helps your body burn calories and improves your physique. Plan to train your muscles two or three times a week on nonconsecutive days. Use free weights, weight machines or resistance bands for all your major muscle groups on each resistance-training day. Weights should be heavy enough that by the last rep, usually eight to 12, you're struggling to finish. Most whey protein powders are flavored, although you can get them plain. Mixing with water saves calories, but consider blending with low-fat milk for flavor, additional calories and carbs, if needed. This is especially important if you're drinking your whey protein shake after weight training. For 30 minutes following a workout, your body is at its peak for muscle building, and it's recommended that you consume a snack containing both protein and carbs within that time frame. Most whey protein powders are not rich in carbs, with only up to 6 grams of carbs per scoop, and blending a cup of nonfat milk with your whey protein adds 12 grams of carbs and 80 calories to your shake. If you're lactose intolerant, avoid whey protein concentrate and instead use shakes that contain whey protein isolate or hydrolysate. Also, if you have a medical condition such as kidney or liver disease, consult your doctor before adding protein shakes to your daily routine.